I was reading through issue three of Brave the Labyrinth (get it! It's free!) when I came across the Grimp character class. The idea behind the class is that, rather than playing one character, you play a whole group of tiny imps (grimp, geddit? ), all standing on one another's shoulders, using limited telepathy and acrobatic skills to coordinate their actions as though they were one creature. The number of imps in your 'body' is equal to your hit points: so if you have ten HP, you're a pile of ten little imps, and so on. You aren't one person at all: instead, you are playing an indeterminate mob of nameless minor characters who follow the other PCs around. You might be a pirate crew, a band of Merry Men, a bunch of faceless stormtroopers, or anything else, but two facts remain constant: there are a lot of you (although exactly how many seems to vary from scene to scene) and, despite your numbers, collectively you only manage to achieve about as much as each of the main characters does individually. At best. You're not playing Barbosa. You're playing the other guys. The essence of playing as The Extras is that you aren't playing as a specific group with clearly-defined numbers and capabilities (e.g. 'the six archers Alice hired in the city'): use the regular henchmen and followers rules for those. Instead, you're playing as that bunch of guys who are milling around in the background in every scene. Every time you get in a dangerous situation, one or more of you probably dies just in order to show that things are serious; but, mysteriously, these deaths never seem to affect your overall numbers. If, for any reason, it ever becomes necessary to determine exactly how many of you there at a given moment, then roll 1d12+6; but the number rolled has no effect on how many of you there are in the next scene, or indeed in the next combat round. Hit Dice: 1d12. The Extras aren't individually very tough, but there are a lot of them. To-hit, Hit Dice, Weapons and Armour, Saves: As per Fighter. Experience Per Level: As per Magic-User. Safety In Numbers: Apart from named characters (see below), The Extras always go around in a single big mob. If you use a battle grid or similar, assume that this mob of extras takes up an area 20' square whenever possible. (In a 5' wide tunnel, they'd form a single line 5' wide and 80' long.) They always move as a single mass, and can attack or be attacked by anything within 5' of the mob. Many Hands Make Light Work: Whenever they're performing some kind of unskilled labour - e.g. standing watches, digging ditches, carrying treasure, rowing oars, etc - The Extras can accomplish the work of ten men. Even though there are more of them than that. Probably. Most of the time. Too bad these Extras only have five sets of legionnaire gear! No bonuses for them! Magic For the Masses: The Extras can collectively have any number of magic items 'equipped' at once, but they can only gain the mechanical benefit from each item once per scene. (The guy with the magic sword steps up to take a swing, or the guy with a magic shield steps up to block a blow, and then they just fade back into the mob.) If the item in question is assigned to a Named Character (see below), then its benefits also apply to any independent actions they may take. Once per scene, you may have this character take an action independently of The Extras: so The Extras could attack an orc while Sarge ran off to warn the other PCs, or whatever. This is the only exception to the rule that The Extras must always act as a single unit, and it effectively gives you two actions for that round only. Next round, Sarge is assumed to have been absorbed back into the general group, and will spend the rest of the scene acting as part of the mob. Each time you level up, you may create one more Named Character, by giving one of The Extras a name and a single distinguishing characteristic. (E.g. 'Private Wilkins, always drunk'.) Just like Sarge, each of these named characters may also take one independent action per scene, but only one named character may take such an action per round. Example: Kat's Cutthroats (level 3) have three named members: Kat herself (their Sarge), No-Ears Jake (their musician), and Silver Fork Sarah (who claims, and may actually believe, that she is secretly a princess). When they get into a fight with some goblins, the Cutthroats may act twice on up to three rounds of the ensuing combat: the Cutthroats take one collective action per round, in one round Kat can take an action, in one round Jake can take one, and in round Sarah can take one. Once all three Named Characters have taken one action each, the Cutthroats revert to their normal single collective action per round. Die All, Die Merrily: If The Extras are ever reduced to 0 HP, describe them all dying in some suitably tragi-comic fashion. The only survivors of this massacre will be the Named Characters. The person playing The Extras can immediately continue play as Sarge, who can be assumed to be a Fighter of one level lower than The Extras; the other Named Characters will be fighters of half the level of The Extras, rounded down, who will instantly become Sarge's henchmen (or someone else's, if this would take Sarge above their limit.) Each of these characters emerges from the general massacre with only (1d6x10)% of their maximum HP. Example: Kat's Cutthroats (in the example above) are reduced to 0 HP by the goblins. The only survivors are Kat (who becomes a level 2 fighter, and a new PC), and Jake and Sarah (who become level 1 fighters, and Kat's henchmen). If all the named characters survive the adventure and make it back to town, they may recruit a new band of faceless followers and regain their status as The Extras. If this happens, then the Named Characters merge happily back into the new mob. 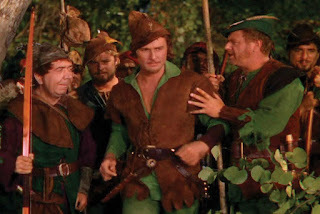 If, on the other hand, Sarge or any of the other Named Character goes on to die before a new band of Extras can be recruited, then the remaining ones decide sorrowfully that It Would Never Be The Same Without Them and remain as ordinary PCs and henchmen forever. They sound very tough. I'd suggest that as some penalty for them all dying each time they all die the new mob loses a level - i.e. one named extra dies in any extra death. Also gain XP as Elf. Funnily enough, my first draft included both of those things! I took them out because I thought the Extras would have enough problems as it was: they'll usually have poor AC (due to tenfold armour prices and limited benefit from magic items), and their large battlefield 'footprint' makes it difficult to shield them from harm by hiding, taking cover, standing behind the fighter, etc. I can see how they could be a problem if their player used the Extras cynically, as essentially nothing more than a big pile of ablative HP for their 'real' character. If you thought your players were likely to play them like that then by all means increase the XP per level and impose level loss upon 'death'. Also, I've just realised the dying rules are horribly unbalanced at high levels. Time for a quick rewrite! d12 is a big die and all, but since they're otherwise taking damage just as everyone else, collectively (unless I missed something), I don't think it's that big. Especially since you need ten times the equipment to outfit them and they have a LOT of hittable surface area. They're also a logistical nightmare in a dungeon. I like it, it's a funny and innovative ideas. Good job! 10 times the equipment sounds like a lot, but getting them all into medium armor with crossbows, shields, hand weapons and polearms would still be something one could do by 2nd level with ease. They won't have much to start with, but a single treasure haul and they're fine. Plus I can envision all sorts of equipment shenanigans. If the guy with the shield and plate can defend, and the one with the polearm and a loincloth attack you can seriously juggle attack and defense really well. Plus the space thing helps with defense. Stick the extras in front once you get them armored and you battle line just got really long and well protected. have your 'valuable' PCs behind it shooting, casting and stabbing with reach weapons. The party is never outnumbered, and while longer battles are dangerous as the extras will go down from the number of attacks they face (unless you use rules that allow defensive fighting) but that's okay because they split into more stronger fighters when they 'die' and are resurrected at full health next session. Plus they make inventory and thus exploration superfluous by being able to carry everything. Also what happens when the extras get hit with a poison needle trap? Do they all die instantly? Does the death of one of them do 1HP damage or kill sarge? That is to say I love this system in concept, and I'd totally use this as a way of running a group of Npcs under control of the party in special circumstances (lead this patrol! bring these pilgrims to the holy site!) but not as a PC that levels my players would wreck things with it. Perhaps another way of using this would be as a pool for the wastrels, drunkards, orphans and addicts that make up low level henchmen. No leveling though. Dammit, Gus, stop making me do proper thinking about my stupid 'my guy is actually fifteen comedy pirates' class! - Once you've bought your ten copies of an item, then all Extras are assumed to have that item. So either they all have polearms or (effectively) none of them do. The only exception is magic items, which they don't benefit from nearly as much as other people. - There's no way I'd let anyone claim line of sight through a 20' wide mob of extras unless they were on a higher elevation. (Remember, they revert to a 20' square mob whenever possible!) So putting them in front will usually prevent the PCs behind them from engaging the monsters at all - and will probably swiftly result in the extras dying, because a whole bunch of monsters can attack them every turn and they can only strike back once or twice. - I *think* the death of the Extras should usually be a net negative? Even at, say, level 5, all you get out of it is a level 4 fighter and four level 2 henchmen, all of them badly wounded - the henchmen will have an average of 3 HP each! And then if even one of them dies, you can never get the Extras back. Any combat dangerous enough to kill them off in the first place should also be dangerous enough to create a very real risk of them never coming back. - Inventory is certainly an issue. If encumbrance management is a big deal in your game, then you shouldn't allow them, as they essentially give you a very durable baggage train. - By a poison needle trap, you mean a single-target save or die effect, right? Personally, I'd have them all die, yes, via whatever absurd chain of events is necessary to bring that about. Or maybe one dies and the rest panic and run off and are never seen again. I dunno. They're extras. They exist in a kind of indeterminate state at the best of times. Anyway. Good points! Feel free to suggest a rewrite! I kind of like the idea! Have you done any playtesting of it? Nothing on this blog is ever playtested: it's all just stuff I come up with while I'm supposed to be working. If you do give this (or anything else) a try in actual play, though, let me know how it goes! Fookin' marvelous! This is something I needed. It makes sense given swarm creatures and suchlike, but it is a stroke of genius to use it as a PC class. This is amaaaaazing. I'd love to see a whole party of these guys. Exactly what I was thinking! That would be a great party. I haven't been this excited to play a class since the muscle wizard! This is truly an awesome class! I MUST use it somehow with Lamentations of the Flame Princess in my Caverns of Thracia open table campaign! About the inventory... I'd allow at most double inventory space. Or even normal inventory space... after all, the consumables are used as if they were a single character! Why should they be able to carry more stuff? Why should they even be willing to to that? They're sure not getting enough share of the treasure to do the job! Like I said in response to Gus, above, I probably wouldn't allow them at all in a game where inventory management was meant to be a really big deal: in a situation like that, the simple fact of having loads of extra hands to hold things could make a whole lot of difference. Just allowing double space would probably also work. I think the "only consumes as much food/ammo (torches?) as one guy" rule goes too easy. Being consistent and having them require 10x as much food will have the party dragging pack mules down dungeon stairs to keep the extras from starving. Ditto torches and ammo. And I think if the poison needle trap would kill a dude, it must necessarily be a named character, and cliche would have it be sarge. Maybe if the mob is alive when sarge buys it, one of the lietenants steps up to be a new sarge of whatever level mob he can hold together. So the 5th level hooligan mob loses Big Eddie, but the 2nd level Red Gracie steps up to head a new 3rd level hooligan mob. It does lend a certain Die Hard quality to them, since a sufficiently high level group of Extras can go several steps before they get busted down to 1st level and disperses if the last sarge dies. That's probably pretty unlikely to happen before the mob goes to 0 hp and breaks into named characters. If you do run with it, then do let me know how it goes! Sorry, unstated was assuming the "work of ten men" thing covered carrying capacity as well. Sometimes my reading is a bit sloppy. I will post an update but I should add a caveat that while I'd love to try this as a player, I don't think my current DM is ready for it, and it will likely first see the light of day as a way of having the players of the campaign I'd like to run next semester meet "group of human soldiers" on the road, and since the party can't usefully fight a squad of 8d8 0-1 level guys and a handful of leader types in melee, or at least I'd have the devil of a time running such a thing, I'm looking at having the encounter secretly be with d3+1 d3 level mobs. So, not quite as funny as me playing the party's hirelings in general. It could be years before I get a chance to do that. I have seen this idea before. Land of NOD had the Canting Crew class, and I think I once read some old issue of White Dwarf where they proposed to play... I think it was a group of Barghests. Still, would love to add something like this to my game, just for the sheer weirdness of it all. I keep coming back to this post from time to time just to marvel. Hands down one of my favorite ideas for B/X.